2018 Q2: Is that “the end” I see? 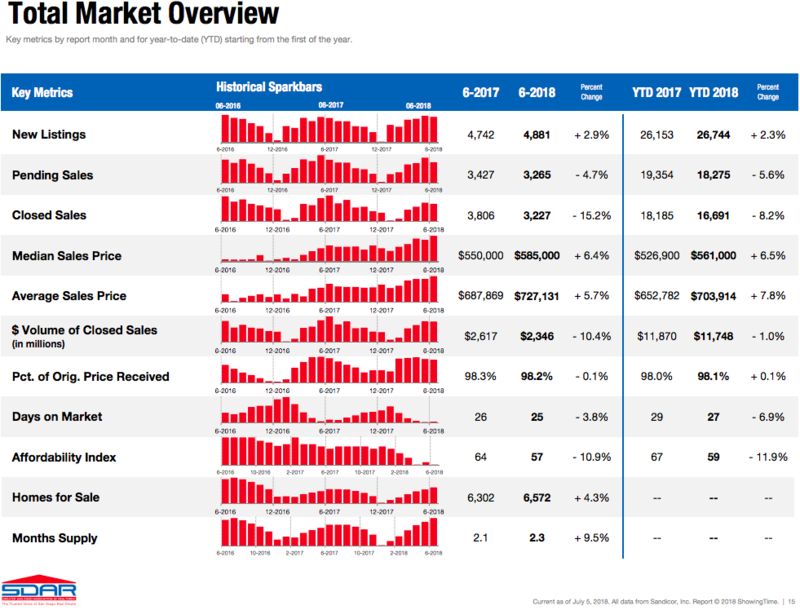 Here’s what I’m seeing from the 2nd quarter of 2018 in San Diego real estate, along with predictions for the rest of 2018…. Always hand-written with stats direct from our local MLS. Seasonally speaking, sales volume was decreasing all quarter. April was about 4% lower, May was about 9% lower and June ended 15% lower than the same months last year. Overall, sales volume this quarter was down 6% total from Q2 last year. Although we’ve seen sales volume declining slightly in the last couple years, it has been accompanied by a much larger drop in inventory of homes for sale. Thus, the minor drop in sales was relative and did not indicate a market softness, nor did we see such a pronounced trend for 3-5 months straight. Prices were rising as demand outpaced supply. This is the first quarter I’ve seen inventory higher than the year before in 5-6 years. But we are still Very low… I could not see a full trend at the end of Q1, but now I do. All 3 months in Q2 were higher than the same months last year. Meanwhile, inventory has been dropping 10-20% year over year for quite some time. The inventory shift and pile up is much more noticeable in the attached housing section, the luxury market, and areas farther east/away from the city/coast. New Listings are up 2.3% for the first 2 quarters of 2018 over the same 2 quarters of 2017 and that is more pronounced in Q2 than Q1. Inventory of detached homes is only up 0.3%, but condos are up 15.8%, while the rolling 12-month average down 12.9 and 1.9 for homes/condos respectively, shows that we this trend I’m calling out is very new. Rates started the year at 4.05% (MND average), then steadily climbed and closed Q1 at 4.51% The second quarter was much less pronounced, but still saw an overall rise to 4.64% by end of Q2. Perhaps this quick rise in rates could be attributed to the slow year, but that’s our new reality. Homes at the same price cost 5% more/month than they did last year if you are financing 80% or more, which is half the reason affordability is 10.9% lower than the same time last year. 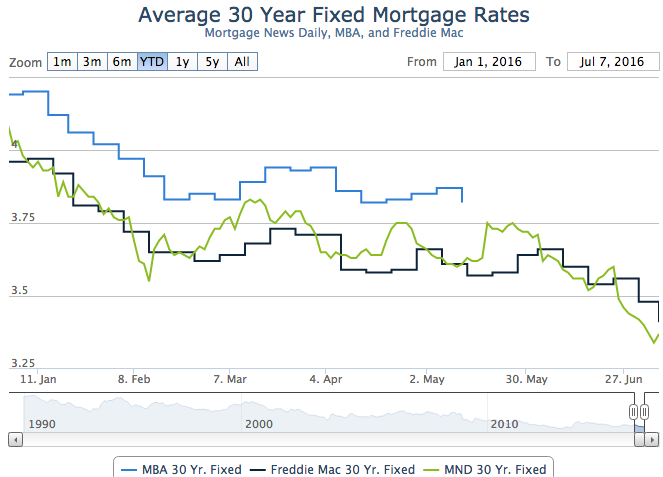 Most lenders I’m speaking with are expecting rates to stay at this level and/or trend slightly up. Especially if we see more world stability accompanied by a rise in Stock prices. The fed raised the Federal Funds Rate 3 times in 2017 and once in mid-March. They raised it again in June and signaled for 2 more hikes this year. Clearly the Fed believes our economy has stabilized and is trying to ward off inflation. We’ve been well below the 2% inflation mark for some time, but that is changing now, too. 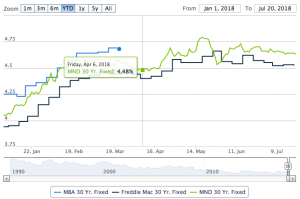 Continued federal fund rate hikes will raise the cost of Adjustable Rate Mortgages (ARM’s) often used on 2nd mortgages and Equity Lines, as well as by people just trying to afford more and hoping to refinance later. I advise anyone sitting in an ARM to look into a fixed mortgage ASAP, unless you intend to sell in the next 2 years, or before your loan adjusts. Tax reform is another big change just pushed through congress that everyone is currently speculating on. In San Diego, various pockets/price-points were effected more than others, but everyone in CA is generally a loser unless you had a direct benefit from the corporate tax cut. The lower prices (under $500k) appear to be less effected than the mid-upper range ($500k – $1.5mil). We are still seeing year over year increases and are also at the end of the usual spring “up” season. That doesn’t mean that prices will continue up, but it is worth noting that we have seen a normal rise in median values this year in the 4-6% range. Detached homes are at record levels at $655k at the end of June and the inventory for detached homes is basically the same as last year, so that market is still relatively strong, compared to the condo market. I am wondering if the removal of the 2nd home mortgage interest tax write-off is effecting the purchases of condos by out of town buyers? It is my belief that the market is peaking and that we are seeing a correction brought upon by a quick rise in interest rates coupled with a negative tax bill for Californians. 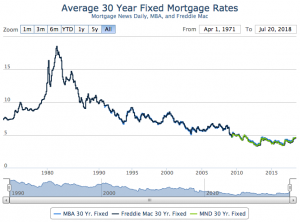 But the time was ripe as affordability was hitting all-time lows already. Prices had been on the rise and inventory on the decline for 5 solid years. It had to happen. Every party has an end. However, we still have super low inventory, an apparently good economy with low unemployment and no sub-prime mortgage mess. We’re still going up in home prices, but the trending numbers I’m reading are indicating a slow down overall. And there are market segments and areas that are going to slowdown first – typically the neighborhoods furthest from the coast and downtown will show the signs first. I’m expecting a slight pullback in these markets for the 2nd half of the year, especially the upper half of the price points in those areas. I’m also expecting a pullback on condo prices that I think we are already in the midst of, except in the sub $250k class as that is still a hot market due to (relative) affordability. For the market as a whole, we are going to keep moving slowly in lumps & spurts for the next 3-6 months. Lower priced “affordable” markets are still in high demand from locals staking their claim, which will keep the “move-up” market going as they don’t care where prices are since they are just trading or “staying in the market”. We may start to see a slight sell-off from those that are retiring, moving out of state, and from investors looking to offload rental property at the market peak. This sell-off will likely come into play more notably next year, but it is likely underway in conversations at dinner tables and in coffee shops with trusted Realtors. I projected a 3-4% gain this spring in home values and 4-6% by end of year, but we’ve already seen 4-5% in the first half of the year. I’m going to stick with my 4-6% guess for the end of year as I’m expecting the market overall to level out and/or do a small pullback (especially if prices rise any further) at year’s end. I predict that inventory levels will rise slowly and end the year at about 5-10% over last year’s numbers. I don’t know what to expect for home loan rates this year as so much of that is tied to the world economy and I’m not even going to speculate on that…. We’ve already seen an approx .75% rise thus far. I’m going to stick with my guess from Q1 that we will end the year around 5%. If you got this far and read my entire article, please let me know what you think with an email/text/call. You’ve got a free lunch coming to you! Adam is an honest person. He is very professional in his dealings. He kept me informed during the sale process. He never forced any decision on me; he provided his recommendations and allowed me to make the final call. Looking forward to working with him in the future on some other transactions.